The Model 2920 RF Vector Signal Generator is a mid-performance test instrument designed for R&D and production testing of modern RF communications equipment and devices. This next-generation instrument combines state-of-the-art RF and digital signal processing (DSP) technology to generate RF test signals with high accuracy and excellent repeatability, to switch frequencies, amplitudes, or modulation types extremely rapidly. 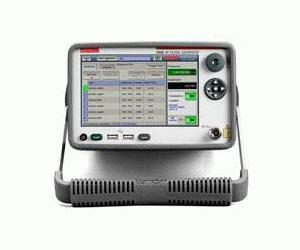 Its compact half-rack enclosure and competitive pricing make it a cost-effective solution for many test applications. Today’s mobile phones are designed to connect to more types of devices than ever before, so they must integrate with a growing number of wireless standards. The Model 2920 simplifies testing mobile phones and other wireless devices economically, by generating signals compatible with an array of RF communications standards. The instrument’s Windows CE® operating system and intuitive graphical user interface allows users their choice of operating it via the touchscreen user interface, the front panel controls, or with a mouse. GPIB, USB, and 100Base-T Ethernet LAN ports offer a variety of options for connecting to a PC; it is LXI Class C compliant, so it’s equally easy to connect to an internal network or the Internet. Tests can be created by developing scripts using SCPI (Standard Commands for Programmable Instrumentation) commands, with IVI-COM or IVI-C drivers, or by assembling LabVIEW® building blocks.